Click on the image above to download a PDF copy of "Voice of the Patient: Barth Syndrome". The Voice of the Patient report is critical for researchers to submit new therapies to the FDA for regulatory approval. It will also inform the clinical trial endpoints that are important to our community. Externally-led PFDD Meeting a HUGE Success Because of YOU! View the Barth syndrome Voice of the Patient Report here. 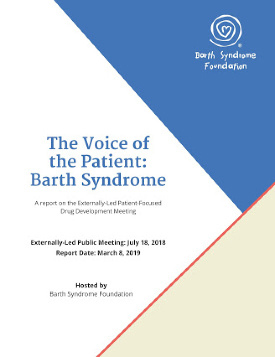 On July 18, 2018, Barth Syndrome Foundation (BSF) hosted an Externally-Led Patient-Focused Drug Development (ELPFDD) meeting to share with officials at U.S. Food and Drug Administration (FDA) and other stakeholders (e.g., industry and research institutions) the perspectives of people living with Barth syndrome (BTHS), its impact on their daily lives, and their expectations and priorities for current and future treatments for BTHS. BSF hosted the meeting as part of the 2018 biennial international Barth syndrome conference, which was expected to convene more than 25% of the world’s known BTHS population. The subsequent "Voice of the Patient: Barth Syndrome" report is a compilation of the testimonies and survey responses of individuals affected by Barth syndrome from all around the world and is the first-ever report of its kind for this ultra-rare condition. BSF would like to gratefully acknowledge the many individuals who participated in this meeting, including caregivers, affected individuals, family members, representatives from industry, clinicians and researchers and leaders from the FDA. 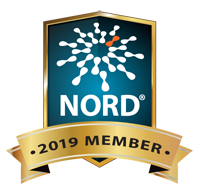 The 2018 Barth syndrome PFDD and the Voice of the Patient report represent important milestones for the Barth syndrome community; it is our hope that this effort and Voice of the Patient Report will inform and influence both drug development and regulatory efforts such that the significant unmet therapeutic needs of people living with Barth syndrome is better understood. More information on the FDA Patient-Focused Drug Development meetings can be found at https://www.fda.gov/Drugs/DevelopmentApprovalProcess/ucm579132.htm and https://www.fda.gov/ForIndustry/UserFees/PrescriptionDrugUserFee/ucm368342.htm.